Data regarding nutrition and pediatric transplantation are limited. However, findings suggest that adult transplant recipients who are well nourished before transplantation have reduced morbidity and mortality rates, shortened stays in the intensive care unit and in the hospital, improved long-term survival rates, and enhanced quality of life (see Nutritional Requirements of Adults Before Transplantation). Children clearly differ from adults in terms of nutritional risk based on age and growth patterns. Because of more rapid growth, younger patients are more likely to experience long-term consequences of nutritional deficiencies than are older children or adults. The pediatric response to illness and operation predictably affects macronutrient and micronutrient metabolism and is frequently influenced by severe dietary restrictions. Because of shortages of appropriate donor organs, patients are often subjected to extensive waiting periods prior to surgery. Aggressive nutritional management during this interval is crucial to achieve optimal outcomes. As a normal response to stress, catecholamines are released from the adrenal medulla and initiate hypermetabolism. Epinephrine release increases hepatic gluconeogenesis, pancreatic suppression of insulin production, and glucagon release. Low insulin levels stimulate fat mobilization for fuel and catabolism of skeletal muscle, increasing plasma concentrations of amino acids. Increased glucagon production fosters carbohydrate metabolism and resultant ureagenesis. The effect of glucagon on urea production results from hepatic gluconeogenesis and the use of alanine for the formation of more pyruvate for new glucose production. This process increases urea synthesis. Therefore, ureagenesis and gluconeogenesis usually proceed at similar rates. Finally, growth hormone is also stimulated during stress and enhances nitrogen retention in the fed state but not during fasting. Increases in energy expenditure and nitrogen excretion are typical manifestations of inflammation, infection, and injury. Operative procedures can increase resting energy expenditure by 24%-79%. 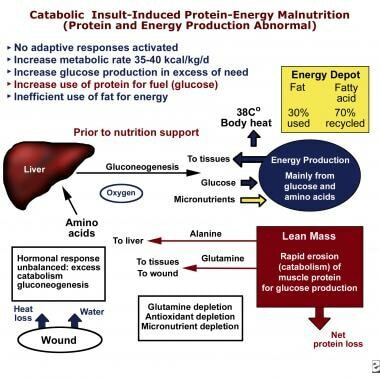 In such patients, maintaining body protein during catabolic illness is difficult (see image below). Prevent or treat malnutrition and establish a positive nitrogen balance. Optimize nutritional status by achieving desirable body weight, muscle mass, and visceral protein stores. Monitor and supplement vitamin and mineral levels to prevent deficiency. Improve nutritional status to counteract the catabolic effects of operative intervention and high-dose immunosuppression. Limit the risk of complications, such as hypoglycemia and infection. Manage nutritional adverse effects of immunosuppressive therapy. Optimize the patient's quality of life. Nutritional assessment should be started early and regularly monitored. It is based on complete medical history, physical examination for signs of nutrient deficiencies or toxicities, and biochemical measurements of nutritional status. Reassessment should be completed at least every 3-4 months. Special attention should be given to the completion of a 72-hour food diary or a food frequency questionnaire. Furthermore, a thorough evaluation for drug-nutrient interactions should occur at routine intervals. Daily weights and estimated dry weights should be obtained in patients with altered fluid status. In addition, the weight-height index can be determined, as can the standard deviation score or Z score (distance in standard deviations of the sample from the mean) for height and the head circumference (for patients ≤3 y). Growth charts are analyzed to determine the type and degree of malnutrition. Chronic malnutrition manifests as stunting. This is best determined by performing serial determinations of the height-age index. With measurements of oxygen consumption and carbon dioxide production, indirect calorimetry allows for precise measurement of the patient's daily caloric needs. For each liter of carbon dioxide produced, the body must generate 1.1 kcal of energy. When indirect calorimetry is not practical, basal energy expenditure (BEE) can be determined based on the Harris-Benedict equation. For male patients: BEE = 66.5 + (13.7 × weight in kilograms) + (5 × height in centimeters) – (6.78 × age in years). For female patients: BEE = 655 + (9.56 × weight in kilograms) + (1.85 × height in centimeters) – (4.68 × age in years). Adjusted body weight = (ideal body weight - actual body weight) × 20% + ideal body weight. To calculate estimated daily caloric requirements, multiply BEE by the stress factor and by the activity factor. For elective operation, multiply BEE by 1.2. For wound or infection, multiply BEE by 1.5. For patients confined to a bed, multiply by 1.2. For patients allowed very light activity, multiply by 1.3. For patients allowed light activity, multiply by 1.5. For patients allowed moderate activity, multiply by 1.6. Kilocalorie requirements can also be estimated using standard nomograms, such as the recommended daily allowance (RDA). Although these values apply to most children, the data may need to be adjusted if patients have severe malnutrition. In malnourished patients who lose or fail to gain weight, energy requirements may need to be increased by up to 50% more than the calculated maintenance requirements. Nitrogen balance studies, such as the 24-hour urinary urea nitrogen test, are the standard methods for assessing protein needs. When these studies are not feasible, estimation based on the RDA for age can be used. These values serve as baselines and may need to be adjusted for the patient's state of malnutrition and/or physiologic stress. * The allowances, expressed as average daily intakes over time, are intended to provide for individual variations among most healthy persons living in the United States under usual environmental stresses. Diets should be based on a variety of common foods to provide other nutrients for which human requirements have been less well defined than these. Asterisks indicate adequate intakes. † RDAs are set to meet the needs of 97%-98% of the individuals in the group. * The allowances, expressed as average daily intakes over time, are intended to provide for individual variations among most healthy persons living in the United States under usual environmental stresses. Diets should be based on various common foods to provide other nutrients for which human requirements have been less well defined than these. Asterisks indicate adequate intakes. †RDAs are set to meet the needs of 97%-98% of the individuals in the group. Vitamin and trace mineral metabolism in pediatric patients has not been well studied. For infants and children, fat-soluble vitamins (A, D, E, K) and water-soluble vitamins (ascorbic acid, thiamine, riboflavin, pyridoxine, niacin, pantothenate, biotin, folate, vitamin B-12) are required and routinely administered. Trace minerals required for normal development are zinc, iron, copper, selenium, manganese, iodide, molybdenum, and chromium. Because vitamins and trace minerals act as enzymes, they are not consumed in biochemical reactions. Therefore, unless these substances are lost (eg, in diarrhea), supplementation of these nutrients in great excess of the RDA is not routinely indicated. In children with end-stage cardiac, liver, or renal disease (in whom deficiencies are most likely present), monitoring for signs of deficiencies, conservatively replacing losses, and observing for toxicities is important. The enteral route is the preferred route of feeding because it is the most physiologic, it is associated with trophic effects on the gut and liver, and it has a lower risk of infections than does total parenteral nutrition (TPN). Small frequent feedings are useful to address anorexia and early satiety associated with end-stage renal disease or end-stage liver disease. In addition, small, frequent feedings may help prevent hypoglycemia and consequently limit the resultant catabolism of muscle associated with hormonal derangements, diminished glycogen storage, and restricted mobilization capacity, all seen in malnutrition. Nutritional supplementation should be considered when a patient does not have normal height velocity or is unable to meet nutrient needs via regular oral intake. Whether via cyclical tube feeding or oral formulas, nutritional supplements aid in the provision of energy and high-quality-protein requirements. Supplementation is especially beneficial in patients who require moderate calories and high protein intake. When prescribing nutrition supplements, one should consider palatability and monitor for intolerance (eg, hyperosmolarity, hyperglycemia, fat intolerance). In infants fed solely by means of tube feedings or TPN, special attention must be paid to regular nonnutritive sucking and repetitive oral stimulation to decrease development of oral aversive behaviors. Human milk has several advantages over commercial formulas. Breast milk contains approximately 87% water and supplies 0.64-0.67 kcal/mL. The fat content of breast milk is high at 3.4 g/dL. Protein and trace elements in human milk are better absorbed than commercial formulas. In addition, breast milk has several immunologic advantages over commercial formulas. When feasible, and with guidance from a lactation consultant, breastfeeding of the infant at nutritional risk should be encouraged. Frequency: More than 3000 children received heart transplants over the past decade. Mortality: The overall 5-year survival rate is 75%-85%. Age: The prognosis is best for the older child or adolescent. Follow the RDAs for the patient's chronologic age, as applicable. Provide additional kilocalories for children who have energy malnutrition to facilitate catch-up growth. Maintenance of ideal body weight is recommended. Body weight more than 140% of the reference range is an absolute contraindication in adults. Obesity is unusual in these patients. No outcome data are available for children with regard to obesity. Protein: Maintain a positive nitrogen balance. Liberally administer fluids according to the patient's cardiopulmonary tolerance (>160 mL/kg/d is rarely tolerated) unless limiting comorbidities (eg, renal insufficiency) are being managed. Most infants are treated with 100-140 mL/kg/d. Fluids are provided as enteral feeding or breast milk with supplemental fluids given by means of TPN. Frequency: Pediatric patients account for 1.4% of all registrants on the waiting list for kidney transplants. Morbidity: Five-year graft survival rates are 92% for patients younger than 1 year, 81% for patients aged 1-5 years, and 80% for patients aged 6-10 years. Mortality: Annual posttransplantation death rates among pediatric registrants remain low. Age: Children aged 1-5 years have posttransplantation mortality rates substantially higher than those of older children. Race: African-American and Hispanic patients with end-stage renal disease have growth deficits greater than those of white patients. In children treated with maintenance hemodialysis (HD), provide the RDA for the child's age plus 0.4 g/kg/d to achieve a positive nitrogen balance. In children treated with maintenance peritoneal dialysis (PD), provide the RDA for the child's age plus an additional increment based on anticipated peritoneal losses. During predialysis, prescribe 23-69 mg/kg/d (1-3 mEq/kg/d). During HD or PD, prescribe 57 mg/kg/d (2.5 mEq/kg/d). Potassium: Patients require 29-87 mg/kg/d (1-3 mEq/kg/d). Phosphorous: Patients require 0.5-1 g/d. Administer 35 mL/100 kcal plus urine output plus losses from HD. During PD, give 100-160 mL/kg/d plus urinary output. Prescribe 100% of the dietary reference intakes for thiamine, riboflavin, pyridoxine, vitamin B-12, and folic acid. Prescribe 100% of the RDA for copper and zinc and for vitamins A, C, E, and K.
Special considerations: These include management of the patient's acid-base status. When the serum bicarbonate level is less than 22 mmol/L, bicarbonate should be added to the patient's parenteral nutrition formula to avoid the growth-restricting effects of metabolic acidosis. Frequency: An average of 477 pediatric cadaveric liver transplants are performed annually. Morbidity: The 3-month allograft survival rate is 76%-86% for all pediatric patients. Approximately 78%-88% of children survive 5 years after undergoing cadaveric liver transplantation. Approximately 83%-87% of children survive 5 years after receiving living-donor grafts. During the somatic growth phase, infants are most likely to be malnourished. Children aged 5 years and younger have the highest mortality rate among all patients awaiting liver transplantation. Children aged 6-10 years have the best 5-year posttransplant survival rate (88%) among all patients. Race: African-American organ recipients have the worst survival rates at all points of follow-up. Fat malabsorption: Interference with intraluminal bile concentration leads to malabsorption of up to one half of the essential polyunsaturated fatty acids and fat-soluble vitamins. By promoting congestion of the gastric and intestinal mucosa, portal hypertension may exacerbate malabsorption. Alterations in hepatic metabolism: Hepatic metabolism of carbohydrates, fat, and protein is disturbed, even in mild liver disease. Reduced hepatic and muscle glycogen stores lead to early recruitment of fat and increased reliance on amino acids as alternative fuels. This alteration in metabolism results in catabolism of muscle, hyperammonemia, hypoproteinemia, diminished glycogen storage and mobilization, hyperlipidemia, reduced circulating triglycerides (because of increased fat oxidation), and hormonal derangements. Increased energy expenditure: Concurrent infections, GI bleeding, operations, and hypercatabolism increase energy requirements by approximately 150% of that predicted by height and weight. Interactions with immunosuppressive therapy: See Nutritional Support. To allow for catch-up growth, prescribe 150% of predicted RDA for the patient's height and age. Avoid restriction. To promote growth and maintain a positive nitrogen balance, 2-3 g of protein per kilogram of body weight per day is recommended. In patients with hepatic encephalopathy that is not attributable to another cause (eg, GI bleeding, infection, dehydration, noncompliance, constipation), restriction to 1 g of protein per kilogram body weight per day may be necessary. Branched-chain amino acid supplementation may improve nitrogen balance of individuals who have severe protein intolerance and whose condition does not respond to aggressive medical treatment of encephalopathy. Provide 2-3 mEq/kg/d (up to 2 g/d or a no added-salt diet). If ascites is present, decrease sodium intake to 1 mEq/kg/d (up to 0.5-1 g/d). A controlled environment in the hospital may be required for monitoring. Avoid sodium restriction to less than a level that affords palatability. Fluid (restriction): If renal function is normal, restrict fluid to maintenance levels (maximum 1-1.5 L/d) when the serum sodium level decreases to less than 125 mEq/L. In the presence of cholestasis in infants, consider use of semielemental infant formulas that contain medium-chain triglycerides (MCT). This maximizes fat absorption because MCTs do not require micelle formation for absorption. The diet should contain enough linoleic acid to prevent fatty acid deficiencies. Frequency: Possibly because of improved management of cystic fibrosis, the frequency of pediatric lung transplantation continues to decrease. Children represent approximately 3% of the total population of lung transplant recipients. Morbidity: Because of the small number of pediatric recipients, generating statistically significant information regarding graft survival is not possible. Mortality: Approximately 134 per 1000 pediatric patients die while on the waiting list. Age: Children aged 1-5 years have a 3-fold increased risk of death while on the waiting list. This finding is consistent with the lack of donors for this population and the severity of illnesses for which lung transplantation is considered. The 5-year patient survival rate after transplantation is 54% in infants younger than 1 year compared with 42% in the general population of lung recipients. This suggests that infant recipients of infant lungs may have an advantage over other age groups. Special testing: Measure the patient's bone mineral density at baseline to assess his or her risk for osteoporosis. Energy requirements: Patients should receive 120%-130% of their BEE. Protein requirements: Patients need to maintain a positive nitrogen balance. Frequency: Pediatric patients are rarely registered for pancreatic transplantation. Morbidity and mortality: Meaningful analysis is currently unavailable because pediatric recipients are so few. A moderate, sodium-restricted, low–saturated fat, low-cholesterol diet is recommended. Energy intake should be adequate for weight maintenance. A scheduled plan of steady amounts of carbohydrate intake at regular intervals may be indicated. Background: Intestinal failure is the inability to maintain nutrition and fluid and electrolyte balance without TPN. When TPN support cannot be maintained because of complications such as advanced liver disease, loss of venous access, or central line sepsis, small-bowel transplantation becomes a therapeutic option. In-depth nutritional education for the child and care providers is indicated. This can be most effectively accomplished via referral to a registered dietitian specializing in pediatric transplantation. Shepherd RW. Pre- and postoperative nutritional care in liver transplantation in children. J Gastroenterol Hepatol. 1996 May. 11 (5):S7-10. [Medline]. National Research Council. Dietary Reference Intakes for Calcium, Phosphorus, Magnesium, Vitamin D, and Fluoride. Standing Committee on the Scientific Evaluation of Dietary Reference Intakes. Food and Nutrition Board, Institute of Medicine, National Academies Press: Washington, DC; 1997. [Full Text]. National Research Council. Dietary Reference Intakes for Vitamin A, Vitamin K, Arsenic, Boron, Chromium, Copper, Iodine, Iron, Manganese, Molybdenum, Nickel, Silicon, Vanadium, and Zinc. A Report of the Panel on Micronutrients, Subcommittees on Upper Reference Levels of Nutrient... Food and Nutrition Board, Institute of Medicine, National Academies Press;: Washington, DC; 2001. [Full Text]. National Research Council. Dietary Reference Intakes for Vitamin C, Vitamin E, Selenium, and Carotenoids. A Report of the Panel on Dietary Antioxidants and Related Compounds, Subcommittees on Upper Reference Levels of Nutrients and Interpretation and Uses of Dietary Reference In... Food and Nutrition Board, Institute of Medicine, National Academies Press: Washington, DC; 2000. [Full Text]. National Research Council. Dietary Reference Intakes for Thiamin, Riboflavin, Niacin, Vitamin B6, Folate, Vitamin B12, Pantothenic acid, Biotin, and Choline. Standing Committee on the Scientific Evaluation of Dietary Reference Intakes. Food and Nutrition Board, Institute of Medicine, National Academies Press;: Washington, DC; 1998. [Full Text]. Kalafateli M, Mantzoukis K, Choi Yau Y, Mohammad AO, Arora S, Rodrigues S, et al. Malnutrition and sarcopenia predict post-liver transplantation outcomes independently of the Model for End-stage Liver Disease score. J Cachexia Sarcopenia Muscle. 2017 Feb. 8 (1):113-121. [Medline]. [Full Text]. Anastácio LR, Davisson Correia MI. Nutrition therapy: Integral part of liver transplant care. World J Gastroenterol. 2016 Jan 28. 22 (4):1513-22. [Medline]. [Full Text]. Bharadwaj S, Ginoya S, Tandon P, Gohel TD, Guirguis J, Vallabh H, et al. Malnutrition: laboratory markers vs nutritional assessment. Gastroenterol Rep (Oxf). 2016 Nov. 4 (4):272-280. [Medline]. [Full Text]. Jeffrey Yang CF, Duro D, Zurakowski D, Lee M, Jaksic T, Duggan C. High prevalence of multiple micronutrient deficiencies in children with intestinal failure: a longitudinal study. J Pediatr. 2011 Jul. 159(1):39-44.e1. [Medline]. [Full Text]. American Dietetic Association. Lung transplant. Manual of Clinical Dietetics. 6th ed. 2000. 541-6. American Dietetic Association. Kidney transplant. Manual of Clinical Dietetics. 6th ed. 2000. 525-33. American Dietetic Association. Heart transplant. Manual of Clinical Dietetics. 6th ed. 2000. 517-23. American Dietetic Association. Small bowel transplant. Manual of Clinical Dietetics. 6th ed. 2000. 555-7. American Dietetic Association. Pancreas transplant. Manual of Clinical Dietetics. 6th ed. 2000. 547-53. American Dietetic Association. Appendix 10, Nutritional implications of immunosuppressive drugs. Manual of Clinical Dietetics. 6th ed. 2000. 835-8. American Dietetic Association. Liver transplant. Manual of Clinical Dietetics. 6th ed. 2000. 535-40. Amii LA, Moss RL. Nutritional support of the pediatric surgical patient. Curr Opin Pediatr. 1999 Jun. 11(3):237-40. [Medline]. Avitzur Y, Grant D. Intestine transplantation in children: update 2010. Pediatr Clin North Am. 2010 Apr. 57(2):415-31, table of contents. [Medline]. Barshes NR, Chang IF, Karpen SJ, Carter BA, Goss JA. Impact of pretransplant growth retardation in pediatric liver transplantation. J Pediatr Gastroenterol Nutr. 2006 Jul. 43(1):89-94. [Medline]. Beaunoyer M, Snehal M, Li L, Concepcion W, Salvatierra O Jr, Sarwal M. Optimizing outcomes for neonatal ARPKD. Pediatr Transplant. 2007 May. 11(3):267-71. [Medline]. Becker BN, Becker YT, Heisey DM, Leverson GE, Collins BH, Odorico JS, et al. The impact of hypoalbuminemia in kidney-pancreas transplant recipients. Transplantation. 1999 Jul 15. 68(1):72-5. [Medline]. Boucek MM, Faro A, Novick RJ, Bennett LE, Keck BM, Hosenpud JD. The Registry of the International Society for Heart and Lung Transplantation: Fourth Official Pediatric Report--2000. J Heart Lung Transplant. 2001 Jan. 20(1):39-52. [Medline]. Campos AC, Matias JE, Coelho JC. Nutritional aspects of liver transplantation. Curr Opin Clin Nutr Metab Care. 2002 May. 5(3):297-307. [Medline]. Chan LN. Drug-nutrient interactions in transplant recipients. JPEN J Parenter Enteral Nutr. 2001 May-Jun. 25(3):132-41. [Medline]. Cohen J, Maurice L. Adequacy of nutritional support in pediatric blood and marrow transplantation. J Pediatr Oncol Nurs. 2010 Jan-Feb. 27(1):40-7. [Medline]. Coleman JE, Watson AR. Growth posttransplantation in children previously treated with chronic dialysis and gastrostomy feeding. Adv Perit Dial. 1998. 14:269-73. [Medline]. Colombani PM, Dunn SP, Harmon WE, Magee JC, McDiarmid SV, Spray TL. Pediatric transplantation. Am J Transplant. 2003. 3 Suppl 4:53-63. [Medline]. Demirag A, Kalayci M, Kantarci G, Gökçe O. Modified quantitative subjective global assessment of nutrition in patients on the renal transplant waiting list. Transplant Proc. 2009 Jan-Feb. 41(1):108-11. [Medline]. Duro D, Bechard LJ, Feldman HA, Klykov A, O'Leary A, Guinan EC, et al. Weekly measurements accurately represent trends in resting energy expenditure in children undergoing hematopoietic stem cell transplantation. JPEN J Parenter Enteral Nutr. 2008 Jul-Aug. 32(4):427-32. [Medline]. Duro D, Kamin D, Duggan C. Overview of pediatric short bowel syndrome. J Pediatr Gastroenterol Nutr. 2008 Aug. 47 Suppl 1:S33-6. [Medline]. Fine RN. Growth following solid-organ transplantation. Pediatr Transplant. 2002 Feb. 6(1):47-52. [Medline]. Fricker FJ, Addonizio L, Bernstein D, Boucek M, Boucek R, Canter C, et al. Heart transplantation in children: indications. Report of the Ad Hoc Subcommittee of the Pediatric Committee of the American Society of Transplantation (AST). Pediatr Transplant. 1999 Nov. 3(4):333-42. [Medline]. Fuji S, Kim SW, Fukuda T, Kamiya S, Kuwahara S, Takaue Y. Positive impact of maintaining minimal caloric intake above 1.0 x basal energy expenditure on the nutritional status of patients undergoing allogeneic hematopoietic stem cell transplantation. Am J Hematol. 2009 Jan. 84(1):63-4. [Medline]. Furth SL, Stablein D, Fine RN, Powe NR, Fivush BA. Adverse clinical outcomes associated with short stature at dialysis initiation: a report of the North American Pediatric Renal Transplant Cooperative Study. Pediatrics. 2002 May. 109(5):909-13. [Medline]. Goulet O, Sauvat F. Short bowel syndrome and intestinal transplantation in children. Curr Opin Clin Nutr Metab Care. 2006 May. 9(3):304-13. [Medline]. Gupte GL, Beath SV, Protheroe S, Murphy MS, Davies P, Sharif K, et al. Improved outcome of referrals for intestinal transplantation in the UK. Arch Dis Child. 2007 Feb. 92(2):147-52. [Medline]. Hofstetter S, Stern L, Willet J. Key Issues in Addressing the Clinical and Humanistic Burden of Short Bowel Syndrome in the US. Curr Med Res Opin. 2013 Mar 12. [Medline]. Högler W, Baumann U, Kelly D. Growth and bone health in chronic liver disease and following liver transplantation in children. Pediatr Endocrinol Rev. 2010 Mar-Apr. 7(3):266-74. [Medline]. Jones JW, Nevins T, McHugh L, Matas AJ, Najarian JS. Nutrition and growth in pediatric renal transplant recipients. Transplant Proc. 1994 Feb. 26(1):62-3. [Medline]. Kaufman SS. Prevention of parenteral nutrition-associated liver disease in children. Pediatr Transplant. 2002 Feb. 6(1):37-42. [Medline]. Kavey RE, Allada V, Daniels SR, Hayman LL, McCrindle BW, Newburger JW, et al. Cardiovascular risk reduction in high-risk pediatric patients: a scientific statement from the American Heart Association Expert Panel on Population and Prevention Science; the Councils on Cardiovascular Disease in the Young, Epidemiology and Prevention, Nutrition, Physical Activity and Metabolism, High Blood Pressure Research, Cardiovascular Nursing, and the Kidney in Heart Disease; and the Interdisciplinary Working Group on Quality of Care and Outcomes Research: endorsed by the American Aca... Circulation. 2006 Dec 12. 114(24):2710-38. [Medline]. [Guideline] KDOQI Clinical Practice Guideline for Nutrition in Children with CKD: 2008 update. Executive summary. Am J Kidney Dis. 2009 Mar. 53(3 Suppl 2):S11-104. [Medline]. [Full Text]. Kelly DA. Nutritional factors affecting growth before and after liver transplantation. Pediatr Transplant. 1997 Aug. 1(1):80-4. [Medline]. Kleinman RE. Pediatric Nutrition Handbook. 5th ed. 2004. Lakey WC, Spratt S, Vinson EN, Gesty-Palmer D, Weber T, Palmer S. Osteoporosis in lung transplant candidates compared to matched healthy controls. Clin Transplant. 2011 May. 25(3):426-35. [Medline]. Leonis MA, Balistreri WF. Evaluation and management of end-stage liver disease in children. Gastroenterology. 2008 May. 134(6):1741-51. [Medline]. McGrory CH, Ondeck-Williams M, Hilburt N, Constantinescu S, Silva P, Daller JA, et al. Nutrition, pregnancy, and transplantation. Nutr Clin Pract. 2007 Oct. 22(5):512-6. [Medline]. Moore LW, Acchiardo SR, Smith SO, Gaber AO. Nutrition in the critical care settings of renal diseases. Adv Ren Replace Ther. 1996 Jul. 3(3):250-60. [Medline]. National Kidney Foundation. Pediatric guidelines. National Kidney Foundation Kidney Disease Quality Outcomes Initiative. [Full Text]. Nayyar N, Mazariegos G, Ranganathan S, Soltys K, Bond G, Jaffe R, et al. Pediatric small bowel transplantation. Semin Pediatr Surg. 2010 Feb. 19(1):68-77. [Medline]. Otte JB. History of pediatric liver transplantation. Where are we coming from? Where do we stand?. Pediatr Transplant. 2002 Oct. 6(5):378-87. [Medline]. Pawlowska J, Socha P, Socha J. Nutrition in pediatric patients before liver transplantation. Rocz Panstw Zakl Hig. 2007. 58(1):111-8. [Medline]. Perlmutter D, Azevedo RA, Kelly D, Shepherd R, Tazawa Y. Metabolic liver disease: Working Group Report of the First World Congress of Pediatric Gastroenterology, Hepatology, and Nutrition. J Pediatr Gastroenterol Nutr. 2002. 35 Suppl 2:S180-6. [Medline]. Pironi L, Forbes A, Joly F, Colomb V, Lyszkowska M, Van Gossum A, et al. Survival of patients identified as candidates for intestinal transplantation: a 3-year prospective follow-up. Gastroenterology. 2008 Jul. 135(1):61-71. [Medline]. Protheroe SM. Feeding the child with chronic liver disease. Nutrition. 1998 Oct. 14(10):796-800. [Medline]. Ramaccioni V, Soriano HE, Arumugam R, Klish WJ. Nutritional aspects of chronic liver disease and liver transplantation in children. J Pediatr Gastroenterol Nutr. 2000 Apr. 30(4):361-7. [Medline]. Rodeck B, Melter M, Kardorff R, Hoyer PF, Ringe B, Burdelski M, et al. Liver transplantation in children with chronic end stage liver disease: factors influencing survival after transplantation. Transplantation. 1996 Oct 27. 62(8):1071-6. [Medline]. Roggero P, Cataliotti E, Ulla L, Stuflesser S, Nebbia G, Bracaloni D, et al. Factors influencing malnutrition in children waiting for liver transplants. Am J Clin Nutr. 1997 Jun. 65(6):1852-7. [Medline]. Rovera GM, Strohm S, Bueno J, Kocoshis SA, Abu-Elmagd K, Todu S, et al. Nutritional monitoring of pediatric intestinal transplant recipients. Transplant Proc. 1998 Sep. 30(6):2519-20. [Medline]. Ryckman FC, Alonoso MH. Pediatric Surgery. Solid organ transplantation in children. 3rd ed. 2000. 597-616. Samonte VA, Sherman PM, Taylor GP, Carricato MN, Fecteau A, Ling SC, et al. Scurvy diagnosed in a pediatric liver transplant patient awaiting combined kidney and liver retransplantation. Pediatr Transplant. 2008 May. 12(3):363-7. [Medline]. Sauvat F, Dupic L, Caldari D, Lesage F, Cezard JP, Lacaille F, et al. Factors influencing outcome after intestinal transplantation in children. Transplant Proc. 2006 Jul-Aug. 38(6):1689-91. [Medline]. Schiesser M, Müller S, Kirchhoff P, Breitenstein S, Schäfer M, Clavien PA. Assessment of a novel screening score for nutritional risk in predicting complications in gastro-intestinal surgery. Clin Nutr. 2008 Aug. 27(4):565-70. [Medline]. Seikaly M, Ho PL, Emmett L, Tejani A. The 12th Annual Report of the North American Pediatric Renal Transplant Cooperative Study: renal transplantation from 1987 through 1998. Pediatr Transplant. 2001 Jun. 5(3):215-31. [Medline]. Shetty AK, Schmidt-Sommerfeld E, Udall JN Jr. Nutritional aspects of liver disease in children. Nutrition. 1999 Sep. 15(9):727-9. [Medline]. Shew SB, Jaksic T. The metabolic needs of critically ill children and neonates. Semin Pediatr Surg. 1999 Aug. 8(3):131-9. [Medline]. Smith JM, Ho PL, McDonald RA. Renal transplant outcomes in adolescents: a report of the North American Pediatric Renal Transplant Cooperative Study. Pediatr Transplant. 2002 Dec. 6(6):493-9. [Medline]. Sokal EM, Cleghorn G, Goulet O, Da Silveira TR, McDiarmid S, Whitington P. Liver and intestinal transplantation in children: Working Group Report of the First World Congress of Pediatric Gastroenterology, Hepatology, and Nutrition. J Pediatr Gastroenterol Nutr. 2002. 35 Suppl 2:S159-72. [Medline]. Sudan D. Long-term outcomes and quality of life after intestine transplantation. Curr Opin Organ Transplant. 2010 Jun. 15(3):357-60. [Medline]. Teitelbaum DH, Coran AG. Pediatric Surgery. Nutritional support of the pediatric surgical patient. 3rd ed. 2000. 17-34. University of Michigan Department of Surgery, Section of Pediatric Surgery. Special Problems in the Nutritional Support of the Pediatric Surgical Patient - Indications for Perioperative Nutrition. 1995-2006. [Full Text]. Wedrychowicz A, Spodaryk M, Krasowska-Kwiecien A, Gozdzik J. Total parenteral nutrition in children and adolescents treated with high-dose chemotherapy followed by autologous haematopoietic transplants. Br J Nutr. 2010 Mar. 103(6):899-906. [Medline]. Yu X, Larsen B, Urschel S, Cheung PY, Ross DB, Rebeyka I, et al. The profile of inflammatory and metabolic response in children undergoing heart transplantation. Clin Transplant. 2011 Dec 14. [Medline]. Zatarain L, Savani BN. The role of nutrition and effects on the cytokine milieu in allogeneic hematopoietic stem cell transplantation. Cell Immunol. 2012 Mar-Apr. 276(1-2):6-9. [Medline]. Casimir F Firlit, MD, PhD Director of Reconstructive Urology, Neuro-Urology and Fetal Urology at SSM Cardinal Glennon Children's Medical Center.